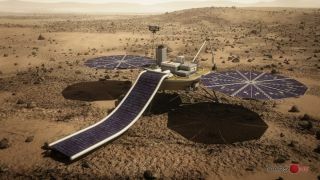 Artist's concept of Mars One's robotic lander, which the nonprofit group intends to launch toward the Red Planet in 2018. Follow Mike Wall on Twitter @michaeldwall and Google+. Follow us @Spacedotcom, Facebook ;or Google+. Originally published on Space.com.